If We Got Some More Cocaine I Could Show You How I Love You at the Old Red Lion. “Man, getting out is easy”. Mikey’s words jar with his surrounding environment. Stuck on a roof in Ennis and surrounded by cops, he and Casey are trapped with only a generous bag of cocaine to pass the time. Escape in this instance is certainly not easy, if at all possible. Yet Mikey’s idea is this: it takes more courage to stand your ground than it does to escape or to walk away. If this is the case then, John O’Donovan’s script is a courageous one. Confining his characters to a roof — meticulously designed by Georgia de Grey — O’Donovan has only his dialogue to fuel the play. Never leaving the roof, O’Donovan inspects the complex and troubled relationship between Mikey and Casey, two young outsiders who have found comfort in each other. Cocaine may be confined to one roof in Ennis, but its sharpness, its insight, and its surprising sweetness extend it far beyond that. With a little help from a strong stimulant, Mikey and Casey reflect on their lives as they wait for an escape route. 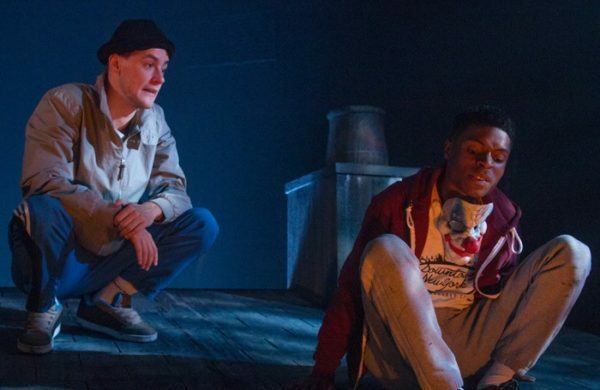 O’Donovan’s script is well-timed and well-balanced: intimate and vulnerable monologues are juxtaposed with quick-talking escape plans and occasional clown masks. In the midst of all this, the white powdery haze tints their world with humour, affection, and true tenderness. Alan Mahon’s Mikey is riotous, charismatic, and highly watchable. Claiming the roof as his terrain, Mahon engenders Mikey with an endearing smirk that also masks an intense violence. With Mikey being the Ennis-native, and Casey (Ammar Duffus) being younger and originally from South London, there is a protective nature to their relationship. While Duffus’s Casey is more reflective and tranquil, there is an imbalance of performances with Mahon’s being the stronger. While the chemistry between them occasionally falters, they succeed in showing their characters’ coping strategies for dealing with love and its terrifying qualities. Apart from drugs and drink, Mikey’s coping mechanism is to be combative. And there is, throughout O’Donovan’s play, a disturbing link between love and violence. Casey’s mother is in love with Bobby, a drug dealer who regularly beats both Casey and his mother. For Casey, to love his mother is to be bruised by Bobby. And Mikey’s past relationships are riddled with violent outbursts that, while delivered with a forced levity, are strikingly gruesome. In a world where being gay is already considered an act of violence to some — either against a sense of decency or religion — the suturing of the two for Mikey is not unsurprising. O’Donovan ruthlessly points out that in positions of social vulnerability, whether related to sexual identity, class or race, human emotions like love and anger are modified and manipulated for the sake of survival. Getting out is an option. And staying is one too. But the tragedy for both Mikey and Casey is that their love will always be a violent one.